In Washington D.C. there’s been a major change in the conversation about transportation funding — and it’s time for Missouri to prepare for what comes next. 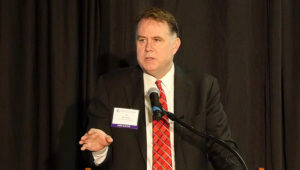 That was the message from national transportation expert Ed Mortimer during the Missouri Chamber of Commerce and Industry’s Transportation Future Summit on Feb. 22. Mortimer, the executive director of transportation infrastructure at the U.S. Chamber of Commerce, said the new White House transportation funding plan gives states more incentive and responsibility to raise funds locally instead of relying on the federal government. The proposal released by President Donald Trump calls for the federal government to spend $200 billion as a way to leverage state, local and private transportation investment — bringing the overall funding total to $1.5 trillion. Mortimer said that the proposal means that projects such as federal highway improvements — currently funded 80 percent by the federal government and 20 percent by the states — would flip to being funded 80 percent by states with 20 percent coming from Washington D.C. The details of how the costs are balanced will certainly change as the proposal moves through Congress. However, the White House proposal reflects the current tone in Washington D.C. which favors changing the status quo on transportation funding. Congress will begin work on the proposal in March. Mortimer said the plan could pass following the November election this year. He urged Missouri leaders and transportation stakeholders to engage with their members of Congress and help shape the final proposal. The state should also begin planning for how a new federal funding structure would impact needed transportation investments here. It raises the urgency for Missouri to act on passing a statewide transportation funding proposal. Mortimer said the White House proposal meets the criteria set out in the U.S. Chamber’s recently-released infrastructure funding roadmap. The plan includes asking the federal government to increase the federal gasoline tax by 25 cents per gallon. The last federal gas tax happened in 1993. “It’s a penny a year for the 25 years we haven’t done it,” Mortimer said. President Trump has endorsed the 25 cent tax increase. Other transportation funding ideas being discussed at the federal level include investing in rural infrastructure, providing grants to spur action on complex infrastructure projects, giving easier access to loans and passing a new framework to allow more private investment. Mortimer also highlighted workforce as a major issue in the discussion that few people are talking about. He noted that if the government passed the entire spending bill today, the country doesn’t currently have the workforce needed to actually do the work. He said Congressional inaction on immigration issues such as the Deferred Action for Childhood Arrivals program and temporary worker status could only tighten the workforce pinch. Part of the solution needs to be inspiring young Americans to look for careers in the transportation infrastructure industry.